This free ESL lesson plan is the last of three lessons on the theme of 'people'. It contains activities, games and other teaching resources that can be used to guide upper-intermediate level students into giving longer answers to simple questions. This is sample board work for the second activity, 'Giving long answers'. See the description for detailed instructions. Students are quizzed about their homework assignment. "Summarise a recent online interview with a well-known celebrity." You'll have to taper your questions depending on how familiar you are with the subject of the interview. However, you can use these general questions to get your students talking. Did they talk about their childhood? Did they talk about the start of their career? So, what have they been doing recently? Are they working on anything at the moment? What was the most interesting/surprising thing that you learned from the article? 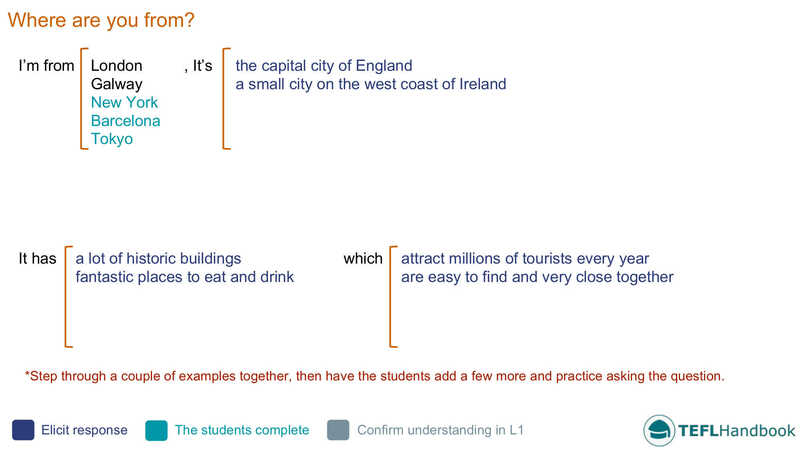 Students learn a couple of tricks that will help them to give longer answers to some basic questions. Do the same with the question "What do you like about the place where you live?" Finally, give the students some time to practise their answers to these questions. Have them interview each other in pairs. If they are feeling brave, they could even pretend to be from another city and modify their answer to suit that. The students will interview each other using questions from the board. In the same pairs as the previous activity, the students will now interview each other using the following list of questions. Before they begin, remind them that they should try to give as long an answer as possible to each question. Could you describe your family home to me? What’s the most interesting place you’ve visited near here? How much exercise do you take each week? Do you like to be physically active or do you prefer relaxing? Are you happier doing mental or physical work? Can you remember your first English lessons? A role-playing game where students pretend to be two famous people who are old friends and haven't talked to each other for a long time. 1. The conversation slows down too much. 2. They wander too far outside the context of the role (Two old friends catching-up). 3. They make three grammar mistakes, which you can review after. For each round, you can elicit the famous people from the other students. Record the times on the board and name a winning pair at the end. For stronger classes, you might want to set a time limit of 2 to 3 minutes. If you found these resources helpful, our next free lesson plan in this course is on formal writing. Also, be sure to check out our full list of upper-intermediate ESL lesson plans. For other levels, have a look at our complete selection of EFL - ESL lesson plans.